People say it is safe to scoop up food within five seconds after it has fallen on the floor. Is that true? Dropped some food on the floor? No matter how fast you pick it up, the bacteria can transfer in less than one second, new research finds. 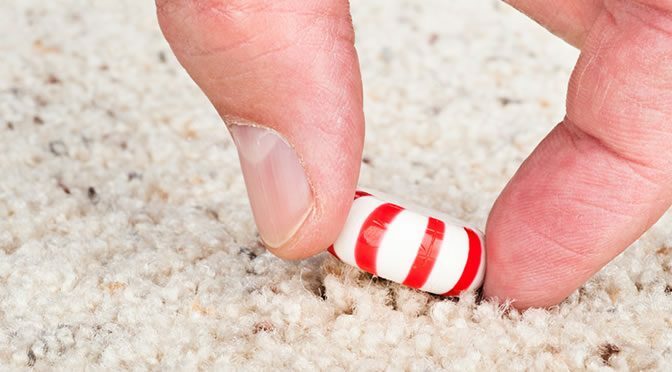 “The popular notion of the ‘five-second rule’ is that food dropped on the floor, but picked up quickly, is safe to eat because bacteria need time to transfer. The researchers tested four different surfaces: ceramic tile, carpet, wood and stainless steel. They used four foods: bread, gummy candy, watermelon and bread and butter. They also used four different contact times: 300 seconds, 30 second, five second and less than one second. They covered those four surfaces with bacteria and let the surfaces get completely dry before dropping the food samples. Water melon had the highest level of contamination while gummy candy had the least. “Transfer of bacteria from surfaces to food appears to be affected most by moisture. Bacteria don’t have legs, they move with the moisture, and the wetter the food, the higher the risk of transfer. Unexpectedly, the transfer rates of bacteria on the carpet were very low compared to stainless steel and ceramic tiles. For wood surfaces the transfer rates varied depending on what food sample was dropped on it. These findings show the importance of factors such as the nature of the food, the surface that the food drops on and the contact time. “The five-second rule is a significant oversimplification of what actually happens when bacteria transfer from a surface to food. The study was published in the journal Applied and Environmental Microbiology (Miranda & Schaffner, 2016).